Knoyme King, a 50-year-old assistant at AT&T, says that she was asked to transfer data from her boss’s old phone to his new phone and found racist memes that were offensive to African Americans. That discovery, along with being denied promotions and getting meager salary raises, King said, led her to file a $100 million discrimination lawsuit against AT&T, the Associated Press reports. 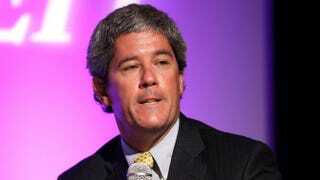 AT&T announced Tuesday that it had fired Aaron Slator, King’s former boss, who was the president of content and sales. One of the images allegedly found on Slator’s cellphone was that of an African child with the words “It’s Friday N—gas,” AP reports. The lawsuit names Slator as a defendant, along with CEO Randall Stephenson and board member Joyce Roche. According to the report, several high-ranking employees have also been named. Skip Miller, King’s lawyer, said that when King told the bigwigs about it, nothing was done to address the issue, and Slator was not reprimanded. “This is an AT&T problem; it’s not just an Aaron Slator problem,” Miller said. Miller said that King, a black woman, has worked at AT&T for 30 years.